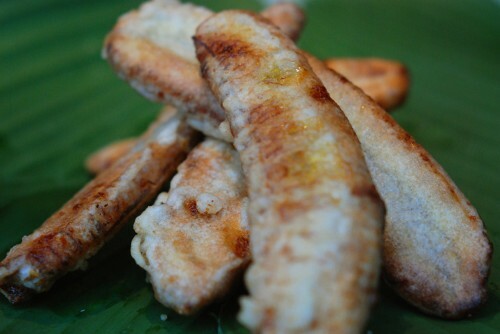 I’ve been trying all week to post the recipe for My Mother-in-Law’s Pisang Goreng (a.k.a Best Fried Bananas Anywhere), and each morning when I’m all gung ho to make them I’ve been stymied…. by the bananas. Rule number one about my Mother-in-Law’s Fried Bananas is the fruit has to be really, really—almost inedibly—ripe. Which a few mornings ago mine still weren’t, and if I’d listened to my husband, Gusky—as in the son who grew up cooking with the mother-in-law who makes these amazing bananas, and who could tell just in passing they weren’t ripe enough—I wouldn’t have wasted half the bunch on a premature attempt at frying them. Then again, if he’d listened to me, there wouldn’t be two bananas missing from the center of the otherwise perfect-for-a-blog-photo bunch because he wouldn’t have eaten them. But speaking of Gusky, now there’s a guy who loves fruit. We met over a glass of pineapple juice, and a few weeks later, when it was eerily clear he was The One, he wooed me with mangosteens outside the royal bathing pool complex in East Bali. I don’t need to add much to the legend of this “queen of fruits” except to say that I was justified in crying when the lady gleefully selling us the mangosteens ran out, and Gusky suggested I follow up with something even better: a durian. I forgave him, and over the next few weeks, as my adventurous palate became apparent, Gusky decided it was time for late-night motorcycle forays to the food stalls around his neighborhood in Denpasar. We passed on the dog and turtle satay, but the other satays (and noodles, and fried rice, and mixed rice, and and and) put Legian’s and Ubud’s restaurants to shame. If you’re thinking it couldn’t have all been good, you’re right. A certain tin bowl of boiled peanuts floating in a warm ginger-y dessert broth comes to mind… along with a general rule that if you’re slurping something brown and watery under the fluorescent glare of a fetid urban lane, and find yourself having to explain to your girlfriend why it tastes so good… it probably doesn’t. What did taste really good? Gusky’s mother’s cooking. I know, what a cliché. I’d been both anticipating and dreading our first encounter, as I was warned by literally everyone that her legendary kitchen skills were matched by an equally legendary temper. To Gusky’s and my undying relief, however, she was warm and welcoming, maybe because to her undying relief, I was young, and pretty, and most importantly not the fifty year old statistics professor (fact check: I had been a peer tutor in college) she’d mistakenly conjured up in her mind. From then on, it was her cooking that put all others to shame. We stopped eating in restaurants, we stopped eating in food stalls. Nobody then and nobody now tops her, from the most complex lawar or smoked duck, to humble rice porridge and even humbler crisp, warm, caramelized fried bananas. Combine the rice flour, water, and salt in a medium-sized bowl and stir until well blended. You’re after a loose paste that will coat the bananas so if you need to add a little more rice flour that’s okay. Pour about three-quarters of an inch (1.5 cm) oil into a small, heavy-gauge skillet and gently heat to 275°F (135°C). If you don’t have a candy thermometer, you can test the oil by inserting a wooden chopstick. It should sizzle gently, not violently, when it has reached the right temperature. 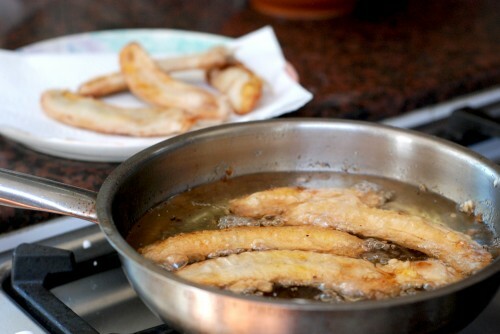 Working in batches, coat the banana slices in the rice flour paste and slide into the hot oil. They should bubble gently. You need a full ten minutes for the sugars of the overripe bananas to seep through the batter and caramelize, so if the oil begins to bubble madly, reduce heat immediately. When the bananas are golden and the sugars have caramelized on their exterior, remove from the oil and rest on paper towel. 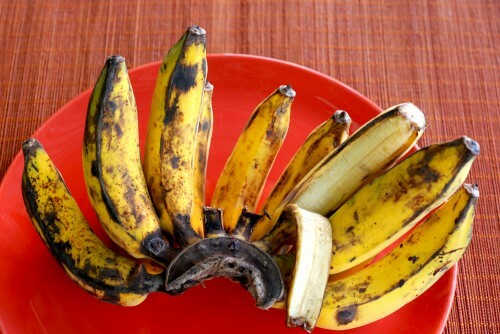 Repeat with the remaining banana slices. ~ Bobby, August 13, 2011 at 7:19 am. ~ eva, August 24, 2011 at 4:12 pm. You never cease to amaze me. Perhaps this is your truest calling. How many bloggists own the word stymied? Elegant food, words, and photos. Wonderful photos, by the way, and I should know. Your blog is beautiful. The food, perfect foodie food. I will share this with Adam. both my kids are consummate foodies and can’t wait to hang out – and eat – with Auntie Karen. ~ Denise, August 29, 2011 at 7:08 am. I’ve just now found Kitchen Insurgency and I LOVE your writing style! Please, make a book! ~ Cat, November 2, 2011 at 11:28 am. ~ Kitchen in Surgency, November 15, 2011 at 5:02 pm.